Drake has planned a few select appearances to promote his VIEWS album: an interview with Apple Music to accompany the release, a return to SNL this coming weekend. According to Ellen DeGeneres, the star will also appear on her show next week. In a clip promoting the event, Ellen dances around to Drake's recently anointed No. 1 single, "One Dance," while a little mini-Drake—of the sort that the rapper used to tease his VIEWS collaborators on Instagram—appears to dance on her head. 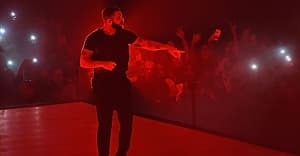 Towards the end of the spot, the screen advertises VIEWS and announces that Drake will appear exclusively on The Ellen DeGeneres Show May 18. Watch above. Drake's album seems to be doing just fine without the TV interviews: VIEWS debuted at No. 1 and helped the star set a pair of records.